I said it many times, and I will say it again – I’m a total sucker when it comes to cute stuff. Maybe aside of Hello Kitty. I’m a huge fan of all the Sanrio creations, aside of Hello Kitty. She’s creepy. When we started to plan our 2017 holidays, Sing brought with him a Hong Kong guidebook for Taipei. Nearly 200 pages of places to visit, food you must try. And from those 200 pages I found all the cute stuff I could do in less than 2 days. 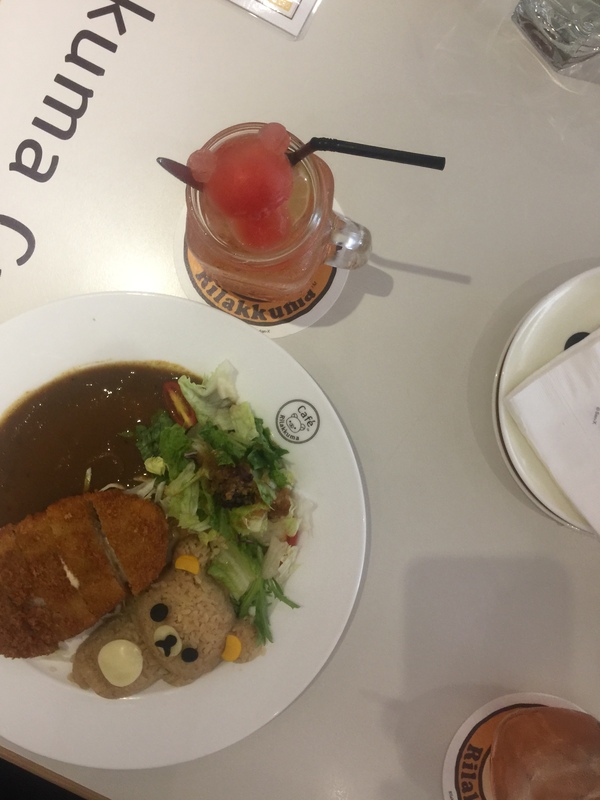 You don’t know the struggle when you have to choose to go either to Rilakkuma Cafe or Kumamon Cafe. I decided to be faithful to that little chubby brown bear and his weird bear/chicken family and review it for you! And yes, I needed an excuse to convince Sing we have to go to the cafe before seeing the palace or Taipei 101. 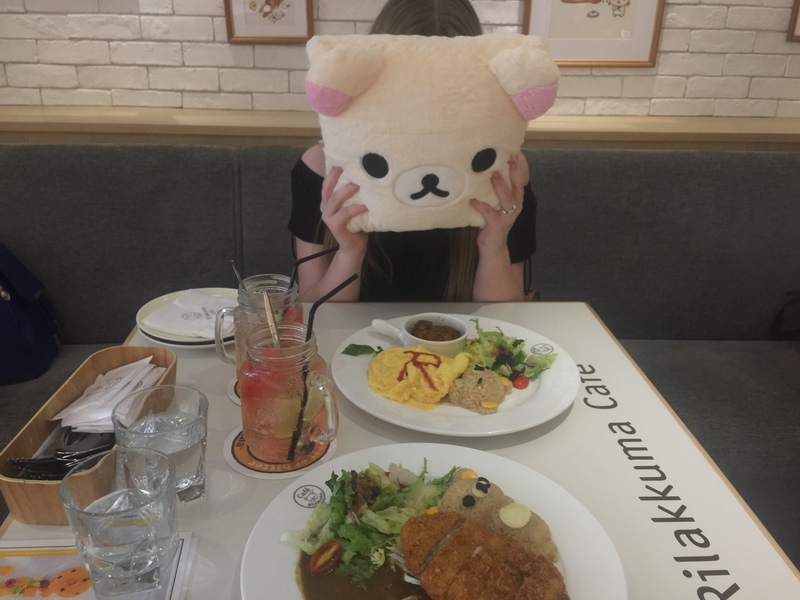 The problem with themed cafes is that usually they look cute, they are perfect places to take nice pictures, but they can be extremely overpriced and taste mediocre. Especially if you have a picky eater with you like my husband. risk spending 10 times more for food that may not be good. It was said in a guidebook that you should book your spot even month ahead, as it is a popular place. Hidden in a small side street, you wouldn’t expect the place to be super-popular, but even though we had our reservation made right after the opening hour it still had plenty of people inside. 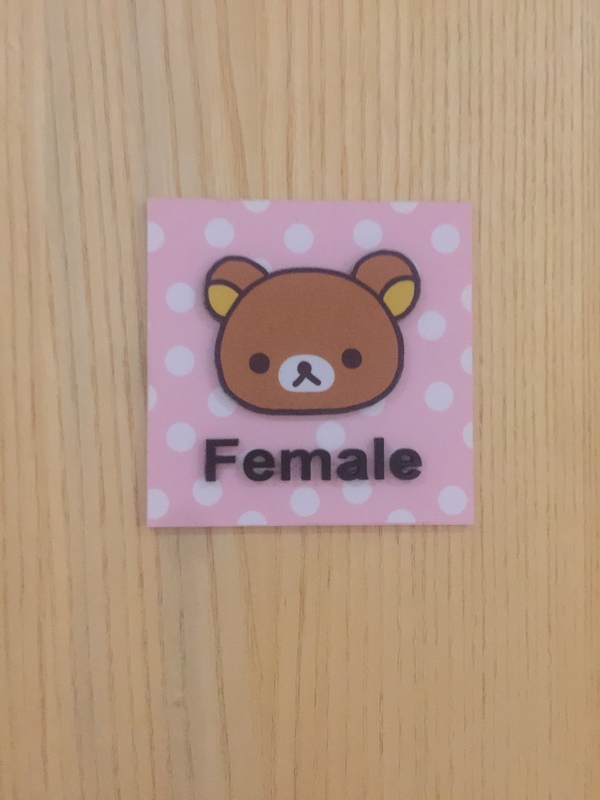 Could so many people be wrong abour Kuma-chan? Let’s start from the interior – you may pretend you come for the food, but let’s face it, it’s the interior and environment you pay for. And it was a blast! 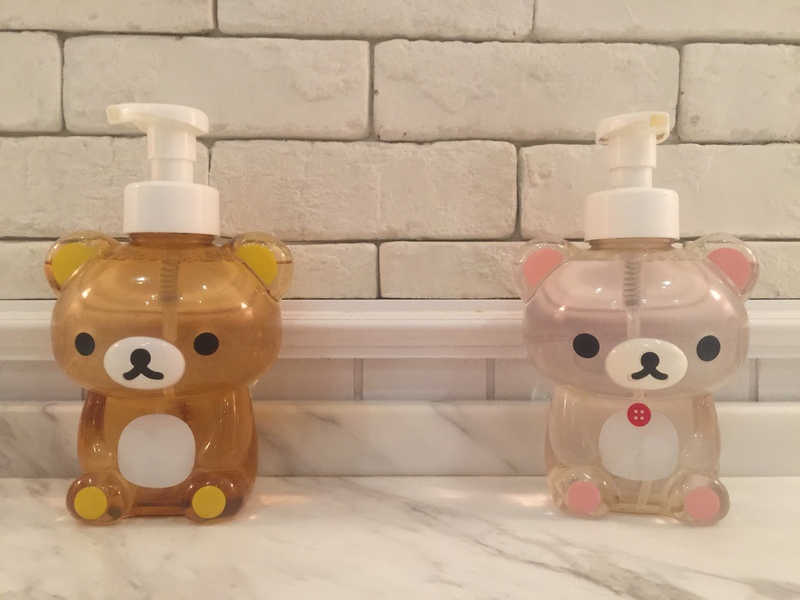 Literally everything was Rilakkuma themed – even the toilet signs, wallpaper, soap dispensers (found them later in Naha, Japan!) or mirrors #MandatorySelfie. 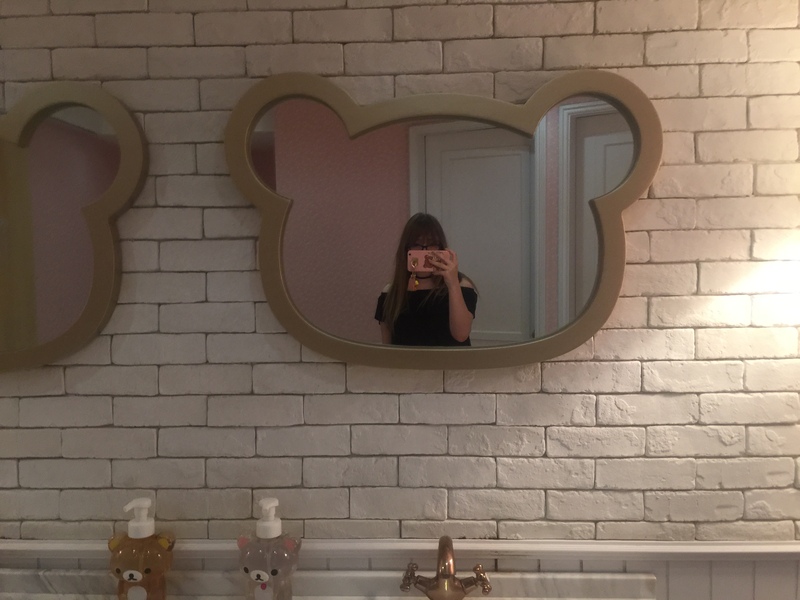 Plenty of Rilakkuma and Korilakkuma cushions, toys, pictures. Even giant status you could take pictures with. For such a sucker like me, it was heaven! Second – the staff. I’m always worried when I shoot a video or walk around and take pictures, that I will be asked to stop. 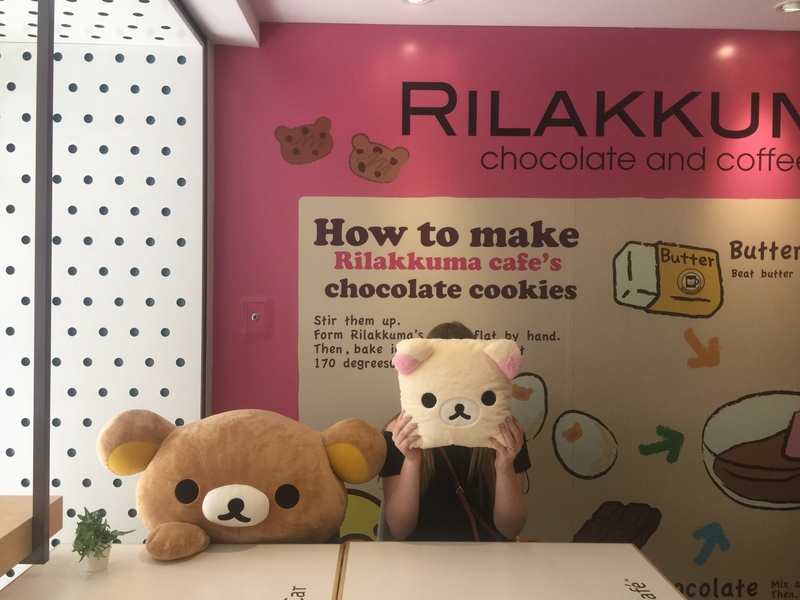 I think the staff at Rilakkuma Cafe got used to people taking selfies, SNOW videos etc. in their restaurant so now they simply don’t care – and I love it! Wouldn’t want anyone to look at me like I was awkward! Even if what I did was really bit awkward. The cafe got full quite early so the waiters were busy, but always kind. They mixed up few of the orders, including mine, but no one made a fuss out of that. More time to spend at the cute cafe. Now we get to the most important part… for Sing. The food itself. We went for a lunch special, drink and shared a dessert. The choice they offer was quite big, it included variety of pastas and salads, but who goes to themed cafe and orders ordinary food? 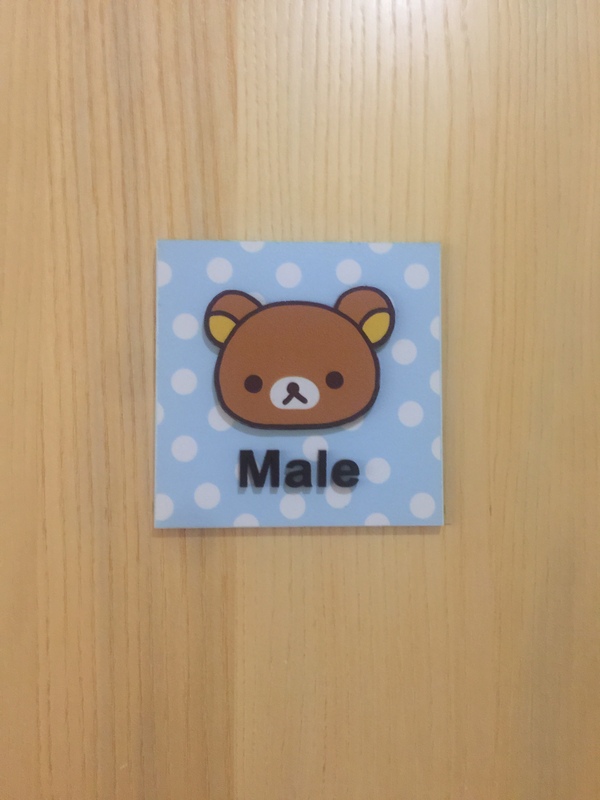 I go there and want everything to be shaped as Rilakkuma. 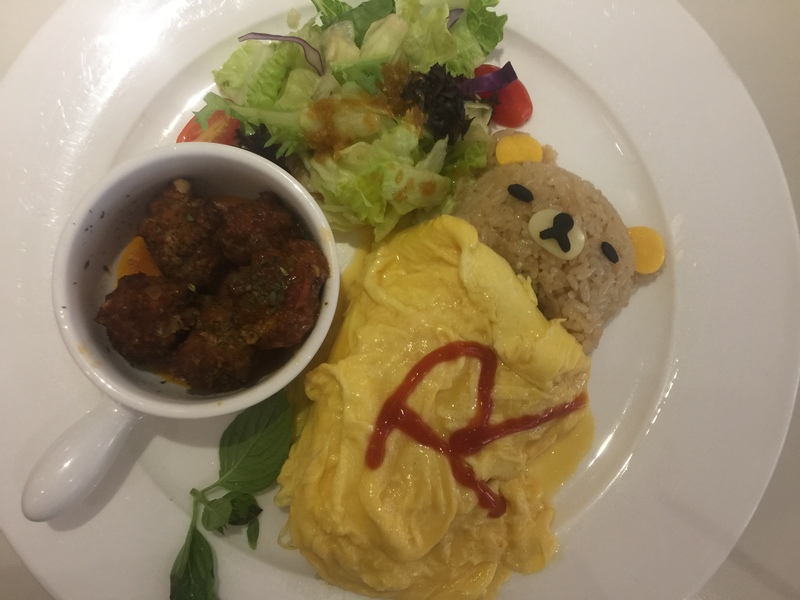 So we went for Rilakkuma curry pork chop for Sing and Rilakkuma omurice with meatballs for me Sadly not shaped as Rilakkuma. Aside of the fact that we had to wait a bit for my meal to arrive as it was mixed up with someone else’s, it was pretty good. 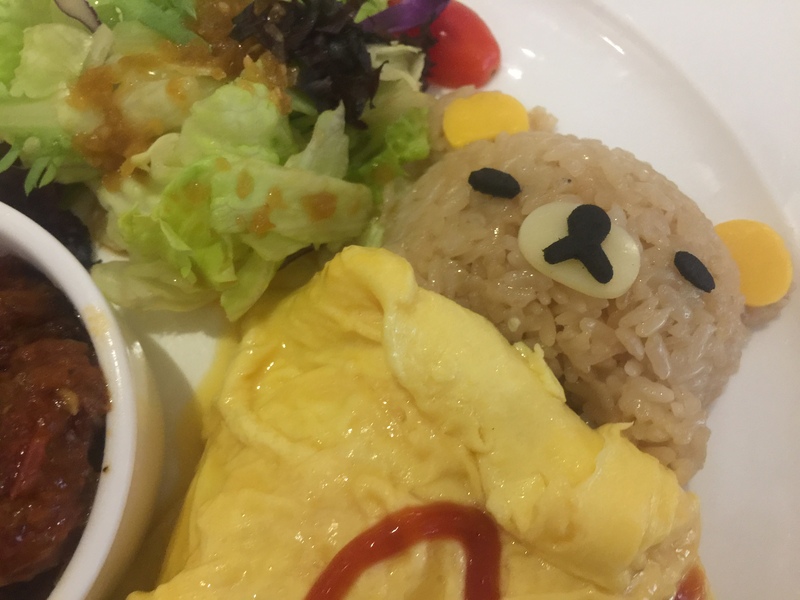 The omurice was moist, with lots of filling inside. The tomato sauce was on a sweet side, but overall it was tasty. The meatballs were fresh, moist inside, dry outside – just he way I like it. Veggies used for the side salad were simple, but the Japanese style dressing gave it lots of flavor. Whole dish was tasty, didn’t make me feel too heavy on my stomach and was a pleasure to eat. Sing got the curry he’d been begging for months. We have no way to fry the pork chop the same way as Irish flats are not allowed to have gas stoves – or at least the building we’ve been living at. The curry sauce was tasted like a standard curry sauce – good, but not extra ordinary. The pork chop fillet was very fresh, didn’t have that weird pork taste (as described by Sing), it was crispy and didn’t get soggy by the sauce. I could hear how crunchy it was when Sing was eating. He also had the same salad as I had. We both were pretty satisfied with our mains accompanied with funky drinks. 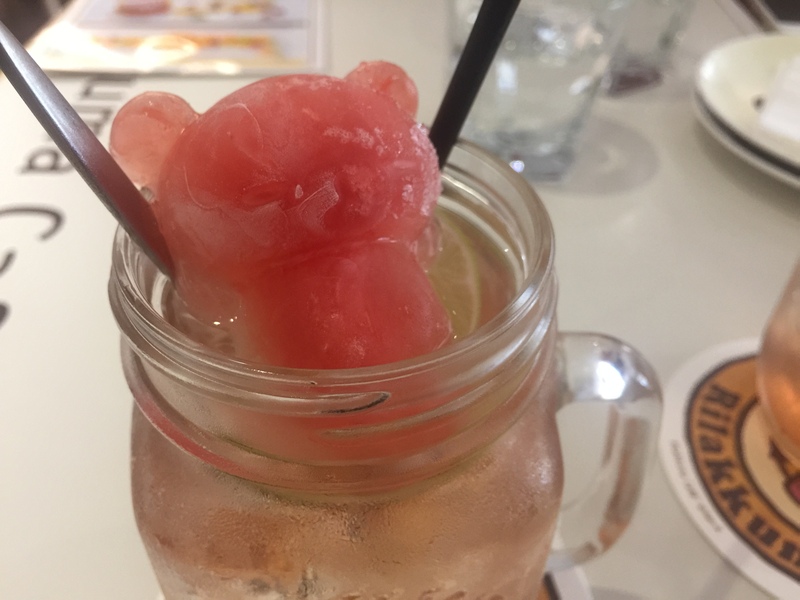 It was really hot outside so when I’ve seen the jars with Rilakkuma-shaped ice inside, I knew what I was going to drink. As this is a cafe they offer plenty of drinks, including coffees, different flavor lattes, fruit sodas, herbal teas. We only had pomelo sodas, but they tasted really nice. 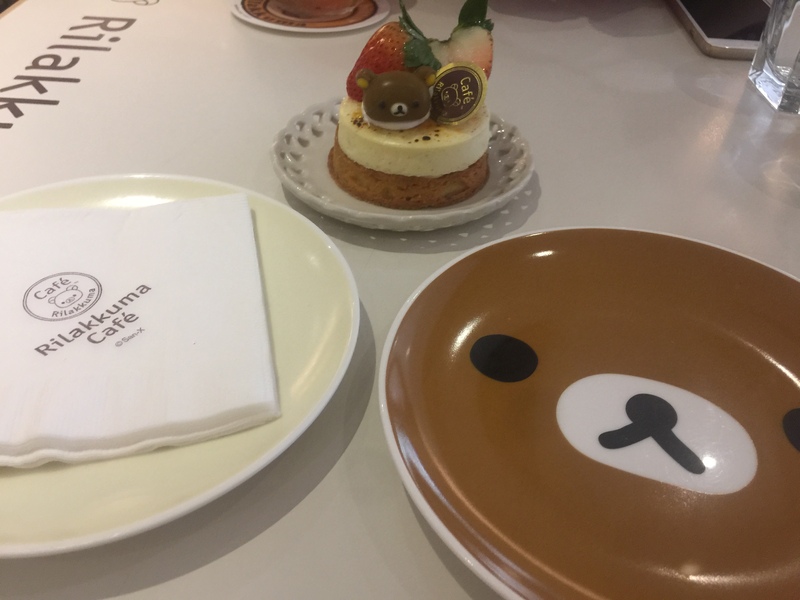 We finished our meal with a simple Rilakkuma-cheesecake. 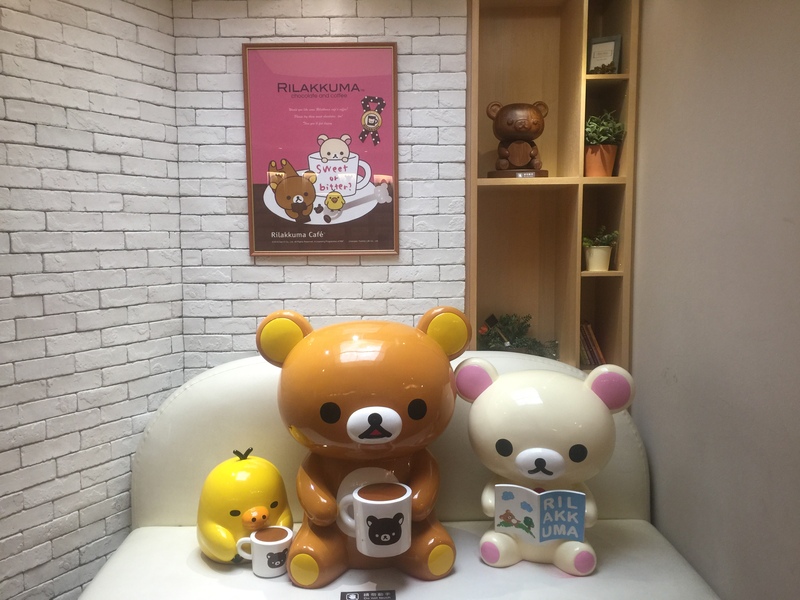 They offer regular-size Rilakkuma birthday cakes so if you have a sucker friend or a sucker partner, you can get them one. The taste was good, the cheesecake part felt very spongy and fresh, not made out of that heavy cream. It was very pleasant to my taste buds. Would I recommend it? Definitely I would! But only for a one time visit. The place is extremely cute, it can be an amazing birthday-party spot, but I have to admit it’s relatively expensive. We ended up spending over 1000 NTD which is not that bad, around 30 Euro – in Ireland we can get a mediocre afternoon tea for one, and that’s not even price in Dublin, but in Limerick. However for someone living in Taiwan or visiting, it could be seen as an expensive diner. I wouldn’t go again – don’t get me wrong, it was so much fun and my heart melted when I’ve seen all the cuteness around, but for the amount of money spent I prefer to spend it for the terrace on Taipei 101 or eat my way through the night markets of Taipei. Have you been to Taipei? Did you have a chance to visit this cafe? Or maybe you would recommend other spots? Let us know, because we would love to hear your opinions! Especially since we fell in love with Taiwan! thank you so much, will need to check it out! 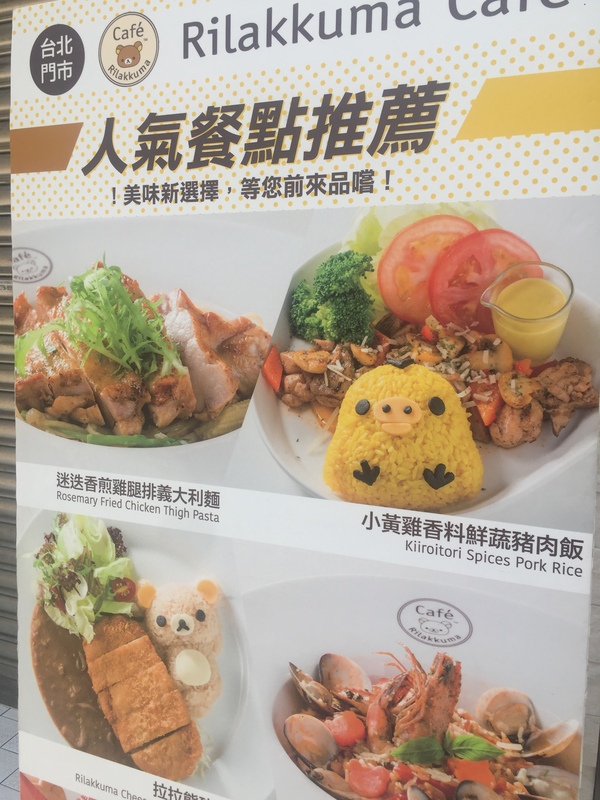 If I show this post to my wife, Taiwan and this cafe will definitely be bumped up to number 1 on the travel list! 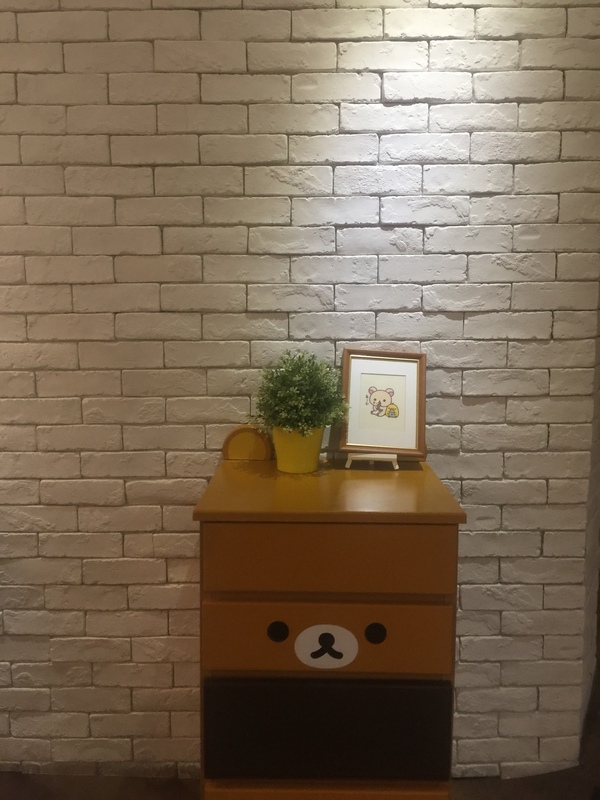 Did you not check out the toilet-themed restaurant while you were in Taipei too? so cute. 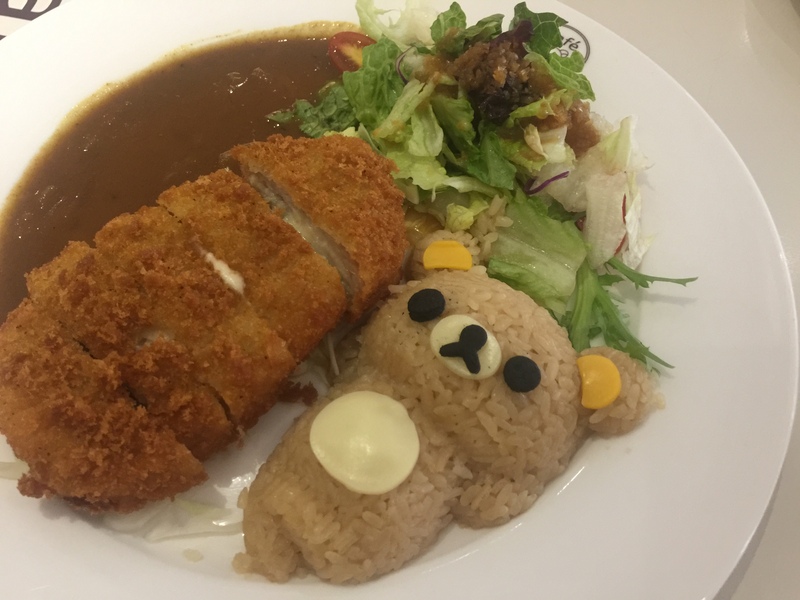 i would certainly pick the fried pork chop with curry.